NCCI –IDEA (Indian Disability Ecumenical Accompaniment) is an Ecumenical Initiative of the National Council of Churches in India, accompanied by Unity and Mission. NCCI – IDEA theologically motivates ministerial interventions of its constituencies by encouraging and facilitating the Indian Churches to be inclusive and disabled-friendly. Considering the importance of inclusivity, the XXVIII Quadrennial Assembly of NCCI has chosen the theme ‘Towards Just and Inclusive Communities” for this Quadrennial. Thus, the Members of NCCI are being encouraged to ensure that their ministerial interventions result in inclusivity. NCCI-IDEA has been a facilitator of conversations with communities in the Church and Society with regard to advocacy for disability rights. Considering the importance of observing this day, the NCCI Executive Committee in 2011 officially approved of designating the Sunday before the Advent as Disability Advocacy Sunday (DAS), since 3rd December is the International Day of People with Disability. Since 2009, DAS is being organized by NCCI–IDEA along with ecumenical organizations, local congregations and institutions both locally and globally. From its inception, DAS is focused on promoting and inculcating the value of ‘An Inclusive Church’, urging the Church to serve as an ‘accompanier’ of PWDs, seeking justice ‘for’, ‘by’ and ‘with’ persons with disabilities. Surveying the past celebrations / observations and the positive responses from the Churches and the local congregations regarding the observance of DAS, NCCI-IDEA expects that the congregations are becoming more open to PWDs and are more Disabled-Friendly. DAS works on a theme every year. 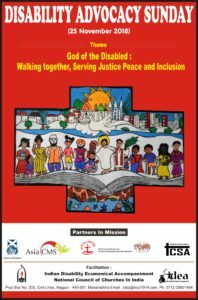 This year’s theme is “God of the Disabled: Walking together, Serving Justice, Peace and Inclusion”. This theme was selected to join the World Council of Churches’ 70th year ecumenical pilgrimage of Justice and Peace. Every year, NCCI – IDEA assists the Churches and the Congregations by preparing an Order of Worship for DAS observances. Since, this year, 25th November 2018 is the Sunday prior to the Advent season, IDEA recommends and encourages churches to observe it as DAS. In case, if anyone is not able to observe DAS on 25th November, please feel free to observe any Sunday that is convenient to you and your congregations. As indicated earlier, NCCI – IDEA’s DAS has inspired several global communities, congregations and organisations through global partnerships to advocate the rights and dignity of persons with disabilities. The World Council of Churches – Ecumenical Disability Advocates Network (WCC – EDAN), the Christian Conference of Asia’s – Asian Ecumenical Disability Advocates Network (CCA – AEDA), Church of Scotland (Board of Overseas Ministries) and ASIA CMS, are joining in the campaign. Therefore, we encourage each and everyone to be part of the campaign and observe this year’s Disability Advocacy Sunday. We are also glad to inform you that NCCI-IDEA organises ‘Christmas of the Disabled’ every year. This is a unique Christmas programme organised and conducted by Children and Youth with disabilities for others. This is organised on the eve of Advent Sunday every year. We are planning to organize this day on 2nd December 2018. Therefore, we encourage you to organize this day, and celebrate along with us in your respective Churches and Congregations. Kindly share with us inspirational stories and experiences of divine interventions through DAS 2018 in your Church or Congregation. Pakistan’s Supreme Court has set aside the death sentence for blasphemy of Catholic woman Asia Bibi and ordered her release from prison. The mother of five was sentenced to death in 2010 on charges of making derogatory remarks about the Prophet Muhammad during an argument with a Muslim farm worker. Rizvi recently warned the judges, the government and local as well as international non-government organizations of “dire” consequences if Bibi was set free. 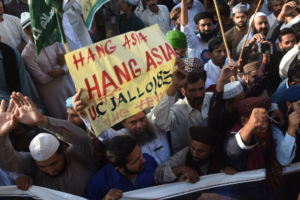 He also threatened Saiful Malook, the lawyer representing Bibi in court.”We will hold massive protests and not let the government function if it releases Asia Bibi to appease the United States,” said Rizvi. The southern State of Kerala is known as ‘God’s Own Country’. It attracts numerous global tourists because of its beaches, mountains, rivers, back-waters, valleys and forests. The land is thus regarded as a miniature expression of the Garden of Eden and God’s wonderful creation. It is unfortunate that Kerala is reeling under one of its worst flooding disasters in its history. There are 39 dams in this State; shutters of 35 dams have been opened. There are 44 rivers in this State, and in 41, water levels have risen above the danger mark; river banks are washed away. Since, it is a land of forests, several land-slides have damaged houses and habitats of the people. The hilly districts of Wayanad and Idukki have received excess rain of 70% and they have got cut-off from the rest of the State due to land-slides and floods. The Cochin International Airport has been waterlogged; the run way is under 3 to 4 feet of water. Therefore the airport is closed. Even the road and river transport has come to a stand still in several parts and routes. As per media reports, the death toll has risen over 60 (as on 15th August) and several are missing. In fact, a Red Alert has been issued in 14 districts. So far the loss estimated is 12,000/- crores. Several have lost their homes, lives, livelihoods, and agricultural fields.Not only have many people lost their dear ones and property, they are also under severe mental stress and anxiety. While people may discuss the reasons for this calamity, it is a time for the entire Nation and the Global Communities to stretch both hands to embrace our sisters and brothers with our prayers and extend whatever support possible. 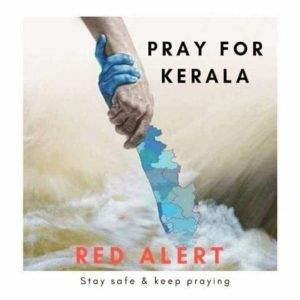 The National Council of Churches in India mourns with the people of Kerala. We assures them of our prayers and accompaniment at this time of trial and experience of crossing the valley of darkness. We hope and pray that the rains will subside and the flood waters recede. Theme: Ecumenical Pilgrimage – Walking, Praying and Working Together. June 21, 2018. 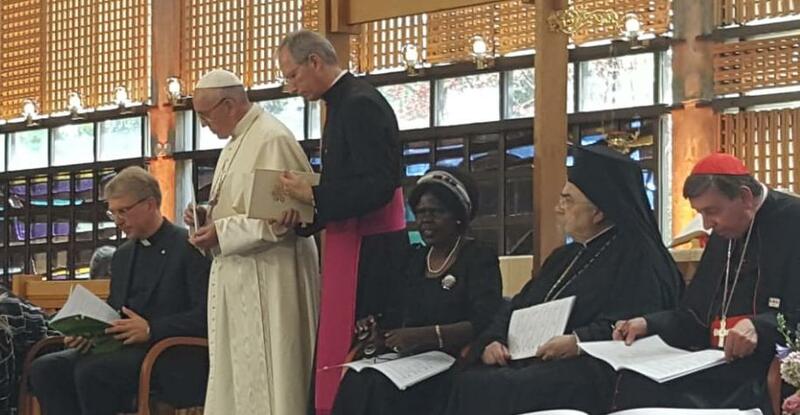 His Holiness Pope Francis on the ecumenical pilgrimage to mark the 70th anniversary of the foundation of the World Council of Churches (WCC) with an address to a prayer service at the WCC Ecumenical Center. The following is the text of his homily. We have heard the words addressed by the Apostle Paul to the Galatians, who were experiencing conflict and division. Groups were fighting and hurling accusations at one another. It is in this context that the Apostle, twice in the space of a few verses, invites us to “walk in the Spirit” (cf. Gal 5:16.25). Walking. We human beings are constantly on the move. Throughout our lives, we are called to set out and keep walking: from our mother’s womb and at every stage of life, from when we first leave home to the day we depart from this earthly existence. The metaphor of walking reveals the real meaning of our life, a life that is not self-sufficient but always in search of something greater. Our hearts spur us to keep walking, to pursue a goal. Walking is a discipline; it takes effort. It requires patience and exercise, day after day. We have to forego many other paths in order to choose the one that leads to the goal. We have to keep that goal constantly before us, lest we go astray. Remembering the goal. Walking also demands the humility to be prepared at times, when necessary, to retrace our steps. It also involves being concerned for our traveling companions, since only in company do we make good progress. Walking, in a word, demands constant conversion. That is why so many people refuse to do it. They prefer to remain in the quiet of their home, where it is easy to manage their affairs without facing the risks of travel. But that is to cling to a momentary security, incapable of bestowing the peace and joy for which our hearts yearn. That joy and peace can only be found by going out from ourselves. The Christian Conference of Asia (CCA) invites applications for the annual session of the Asian Ecumenical Institute (AEI- 2018). Focusing on the theme ‘Wider Ecumenism in Asia‘s Pluralistic context’, the AEI-2018 will be held from 15 July to 13 August 2018 at the Payap University in Chiang Mai, Thailand. The AEI is a month-long annual training programme for young people from various Asian countries come together in an inter-cultural and inter-denominational setting to gain in-depth insights on ecumenism through a variety of learning methodologies. AEI is designed to increase the knowledge and skills of prospective church and ecumenical leaders in Asia who seek to enhance their engagement in church and society and to assume future leadership positions in the ecumenical movement. The programme also aims to empower the participants in understanding the concept and ethos of ecumenism while being anchored on a strong sense of rootedness in one’s own faith, tradition, and heritage,- The course outline and the methodology designed for the AEI-2018 will enable the participants to understand the need for crossing boundaries of denominational, cultural, social, economic and political strata to recognise the value of wider ecumenism. Admissions will be offered to 25 students who will be selected from among the applicants between ages 25 to 35. Selection of prospective participants will be based on competence, gender and confessional balances, national and sub-regional representations, ability to communicate in English. The deadline for receiving Applications will be on or before 31 May 2018. James Hal Cone (August 5, 1936 – April 28, 2018) was an American theologian, best known for his advocacy of black theology and black liberation theology. His 1969 book Black Theology and Black Power provided a new way to comprehensively define the distinctiveness of theology in the black church. Cone’s work was influential from the time of the book’s publication, and his work remains influential today. His work has been both utilized and critiqued inside and outside the African-American theological community. 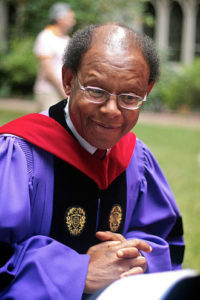 He was the Charles Augustus Briggs Distinguished Professor of Systematic Theology at Union Theological Seminary in the City of New York until his death. (Source: Wikipedia – James Hal Cone). This year marks the 70th year of Nakba: Nakba Day , Yawm an-Nakba, meaning “Day of the Catastrophe” is generally commemorated on 15 May. The day was inaugurated by Yasser Arafat in 1998. For the Palestinians it is an annual day of commemoration of the displacement that preceded and followed the Israeli Declaration of independence in 1948. During the 1948 Palestine War, an estimated 700,000 Palestinians fled or were expelled , and hundreds of Palestinian towns and villages were depopulated and destroyed. These refugees and their descendants number several million people, divided between Jordan (2 million), Lebanon (427,057), Syria (477,700), the West Bank (788,108) and the Gaza Strip (1.1 million), with at least another quarter of a million internally displaced Palestinians in Israel. The displacement, dispossession and dispersal of the Palestinian people is known to them as an-Nakba, meaning “catastrophe” or “disaster”. Israeli occupation of Palestine: At the heart of the Israel/Palestine conflict today lies the question of the Palestinian territories occupied by Israel since the war of 1967, which include the West Bank, Gaza Strip and East Jerusalem. Key issues that have plagued the stalled “peace process” include: Israel’s occupation, Israeli settlements and settlement-building, the Israeli wall, security for Israelis and Palestinians, shared sovereignty over Jerusalem, and the right of return of 3.7 million stateless Palestinian refugees. https://ncci1914.com/wp-content/uploads/2018/04/pleasepray01.jpg 853 1445 Roger Gaikwad http://ncci1914.com/wp-content/uploads/2018/05/NCCILOGO105-300x72.png Roger Gaikwad2018-04-09 11:19:502018-04-09 11:19:50MAY 15, 2018 : 70 Years of the Nakba, the "Catastrophe"
Ecumenism as mission of all churches involves building relationships, challenging the local styles of being church and leading to the sharing of resources by establishing solidarity and accepting the fact that every church is called by God to be a partner in mission, not be isolated. A clear theological self-understanding reflected on the concept of life and mission of the church must be proclaimed with bold options in support of the marginalized people around us. Ecumenism must motivate the church and society to develop a countervailing power in the midst of gloom and despair. Dialogue with people of other faiths and respect of the religious values of our neighbor should be our lifestyle. There is a need to bring an effective awareness among all the Christian communities across India to be united in bringing significant changeswith regards to addressing the evils of caste, creed, colour as well as socio-political, cultural and economic changes which our Indian society has been undergoing from ages and which has seen a rapid growth in the recent times. Therefore it is the need of the hour for the Indian churches and Christian institutions including the theological colleges to work together and work effectively on denominationalism and fundamentalism which can lead to or create differences among the Christian communities and societies. In order to bridging gaps and helping the young dalit, tribal/ adivasi theologians to understand the gospel in totality, as a gospel that deals with humanity and all creation, helping people towards better life integrated with ecology, and which supports freedom, and stands for human rights and eco dignity, NCCI-Dalit and Tribal/Adivasi Concerns in partnership with EMW Germany, Leonard Theological College, Jabalpur and Christian Service Agency organized a three days Consultation on “Ecumenical Formation and Capacity Building for Young Dalit, Tribal/Adivasi Theologians” from 1st -3rd February 2018 at Mahatma Gandhi Assembly Hall, Leonard Theological College, Jabalpur. A total of 41 participants in which 30 Theological Students from twelve different theological colleges/seminaries from the Northern, Eastern and Central regions of India, affiliated to the Senate of Serampore Colleges and 11 Resource Persons participated in the consultation. The consultation started with a creative and participatory worship led by Mr. Pradip Bansrior, Executive Secretary-Dalit and Tribal Concerns-NCCI along with the team of theological students, the reflection was given by Mr. Jianthaolung Gonmei, Executive Secretary- Youth Concerns, NCCI and concluded with the benediction pronounced by Rev. Dr. Naveen Rao, Principal, Leonard Theological College. Following the inaugural worship, Mr. Pradip Bansrior welcomed the delegates and the resource persons and shared the purpose of the consultation and also extended his sincere thanks and gratitude to Rev. Anil Michael, Treasurer- LTC and the administrative body for hosting the consultation in the Leonard Theological College, Jabalpur. 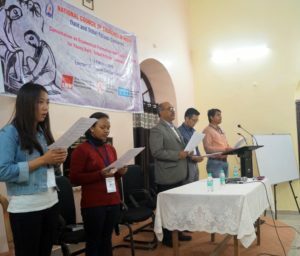 We, 30 young theologians from 12 theological colleges across Northern, Eastern and Central India representing different social and cultural identities as well as churches from different parts of India, gathered at Leonard Theological College, Jabalpur from 1st to 3rd of February 2018 for a Consultation on Ecumenical Formation and Capacity Building for Young Dalit, Tribal/Adivasi Theologians organized by NCCI’s Dalit and Tribal/Adivasi Concerns. During our discussions and deliberations we dealt with many concerns such as trends and development of ecumenical movement from various contextual issues including struggles for Dalits Rights; Rights of indigenous people; Rights of women and children; Youth in the Cyber Age; Human Trafficking, Human Sexuality and Gender Diversities; Prophetic communication; Ecumenical formation; Inter-Religious harmony and Ecological justice. God has created humankind in God’s own image. In the household of God, there is no discrimination on the basis of caste, gender, race, creed, or religion. Unity is the essence of Christianity and the Christian community can transcend differences and divisions by coming together to address social concerns and campaign against evil forces that undermine or violate people’s rights and dignity on the basis of their gender, generation, caste, tribe, ability or sexual orientation. Our God is the God of love, compassion and justice who always takes the side of the oppressed in their struggle for justice and liberates them from oppressive and unjust systems. The ecumenical spirit transcends ecclesial realms and facilitates visible unity and symbiotic living with all of God’s creation, peace and reconciliation with people of all faiths, and commitment to social causes. The Church has to take serious cognisance of the changing socio-political, cultural and technological context, and should engage with the same meaningfully, relevantly and effectively. The Church is called to remain committed particularly to the cause of Dalit and Tribal/Adivasi communities in her prophetic ministry. We reject and condemn any discrimination and social injustice within and outside the church, denying the rights to the fullness of life of women, youth, children, Dalits, Tribals/Adivasis, sexual minorities and of nature. To declare and accept social diversities in gender, caste, race or creed as designs of God. To widen the ecumenical movement beyond ecclesial relationships within and among the churches, and even beyond inter-religious relationships to inter-human relationships and integrity of all creation. To be more inclusive, and to be more sensitive towards sexual minorities and marginalised sections of the society. To incorporate teachings of peace and reconciliation not only in curricula, but also to practice the same in day to day lives. To understand and interpret the Scripture in a holistic manner of inclusivity and ensure justice and equity for all creation. To strengthen prophetic communication with regard to issues of women, children, Dalits and Tribals/Adivasis, sexual minorities and nature. To publicly affirm the identity of Dalit and Tribal/Adivasi communities and promote their spirituality. To make use of Dalit/Tribal/Adivasi cultures and traditions in strengthening grassroots ecumenism. Greetings of Peace from Women Concerns Ministry of National Council of Churches in India. It is our pleasure to share with you the Resource Material of World Day of Prayer 2018. The theme of 2018 WDP is “All God’s Creation is Very Good!” . 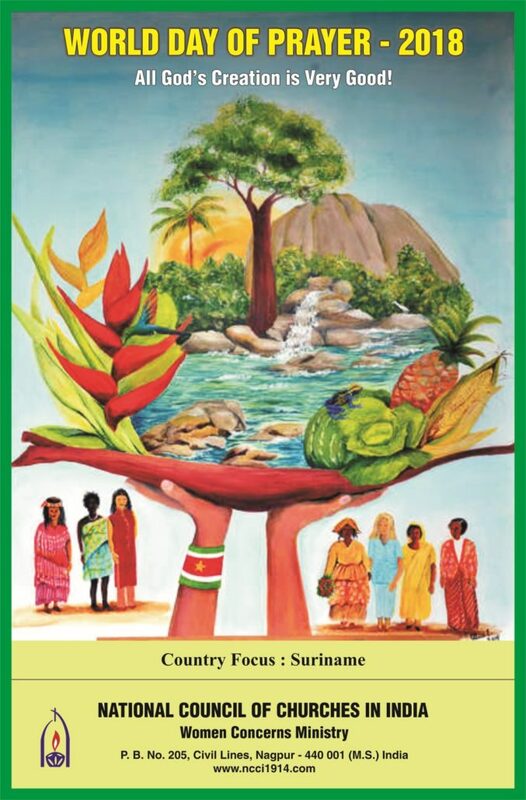 This year WDP Resource Material is prepared by Suriname WDP Committee, shared by World Day of Prayer International Committee (WDPIC) and contexualized in India by Women Concerns Ministry, NCCI. The WDP is a global ecumenical movement led by Christian Women who join in prayer for peace and justice. It is run under the motto “Informed Prayer and Prayerful Action.” The movement aims to bring together women of various races, cultures and traditions in a yearly common Day of Prayer as well as in closer fellowship, understanding and action throughout the year. Every year it is commemorated on the first Friday in March and a particular country is chosen as country of focus . The WDP Committee prepares the resource material on particular theme. The 2018 Resource material reflects how Women from Suriname lift up their voices to remind us that we are caretakers of God’s creation! How good is God’s creation? That is the question to meditate upon and respond to with a personal commitment to care for creation . They are bringing to our attention the urgent need for caring at a time when more than 180 countries have signed the Paris Agreement on Climate Change: A commitment to take care and heal wounded mother Earth. Through the worship service, we listen to the multicultural and multi-ethnic people of Suriname. They take us to their communities and through their concerns. History is before our eyes! The flora and fauna is remarkable! Everyday life is weaved into prayers. Through WDP a movement for “informed prayer and prayerful action” we encourage women’s fellowships in India and churches to care of creation throughout the year . We encourage you to involve children and youth during the worship as they are our future stewards and care takers of mother Earth. Not only will they carry the legacy of WDP Movement but sow seeds of justice and peace in the world. We have already sent the Resource Material to National Women’s Fellowships of member churches of NCCI. Please share these resource materials with local dioceses, women’s fellowships, church leaders, ecumenical partners, theological colleges and Christian institutions. Looking forward to all your solidarity in practicing and promoting WDP (Informed Prayer and Prayerful Action) movement.